and contains very powerful anti-oxidants. 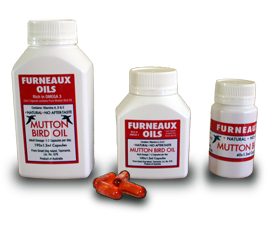 Muttonbird oil has been a part of the Furneaux Island peoples' diet for many years. Powerful anti-oxidants and essential Omega 3 oils support good overall health. Healthy heart - assists with circulation and thrombotic conditions etc. Healthy joints - with an increase in joint comfort. Brain and nervous system function and development. Helps to ward off coughs and colds. The list goes on to enhance your health and well-being. Just a note to let you know that my husband and I come from Brisbane and have Mutton Bird Oil Capsules sent to us, from Tasmania where they are packed. My husband has always had a problem with his cholesterol and he thought he would try these, his levels were up to 7.2 six months ago and is down to 5.2 and his doctor is very pleased with him. So thankyou to the people who had the sense to bottle mutton bird oil capsules.